A large number of today’s massage therapists tend to leave bodywork school with a solid foundation in manual therapy for stress relief and relaxation. These folks often have been introduced to other kinds of bodywork as well, perhaps including more clinical methods of massage. However, gaining the skills necessary to practice a modality that aims for pain relief rather than relaxation alone typically requires continuing education. Practitioners who would like to incorporate techniques such as skeletal alignment, joint mobilization and deep tissue massage in order to provide lasting pain relief to their clients would do well to consider continuing education courses in Myoskeletal Alignment Techniques, or MAT. Developed by Erik Dalton, this modality makes effective pain management its main mission. Dalton began his bodywork career more than three decades ago as a certified Rolfer, but he found himself reaching beyond structural integration in a quest to offer more permanent and effective services to the many clients he met who were suffering from chronic pain. It was this quest that led to the creation of Myoskeletal Alignment Techniques, which places a strong focus on the reflexogenic relationship of muscles, ligaments and joints. According to Dalton, the term “myoskeletal” refers to muscles and fascia, plus spinal biomechanics. For practitioners of MAT, the promotion of skeletal alignment through an array of evidence-based techniques is one of the biggest keys to managing chronic pain. Therefore, it’s no surprise that MAT emphasizes postural assessment prior to most of its pain-management protocols. In order to perform MAT and provide clients with the kind of pain relief and improved function that comes from proper skeletal alignment, it is necessary to receive continuing education in this specific form of clinical massage therapy. Fortunately, Dalton has developed an impressive number of quality CE classes over the years, carving out a place as one of the leading continuing education providers in the entire field of manual therapy. Today, practitioners can choose to enroll in online MAT classes, purchase a home-study program or book a seat in a live MAT seminar. With each MAT continuing education class you take, you will be building your pain-management skills and taking your expertise to higher and higher levels. 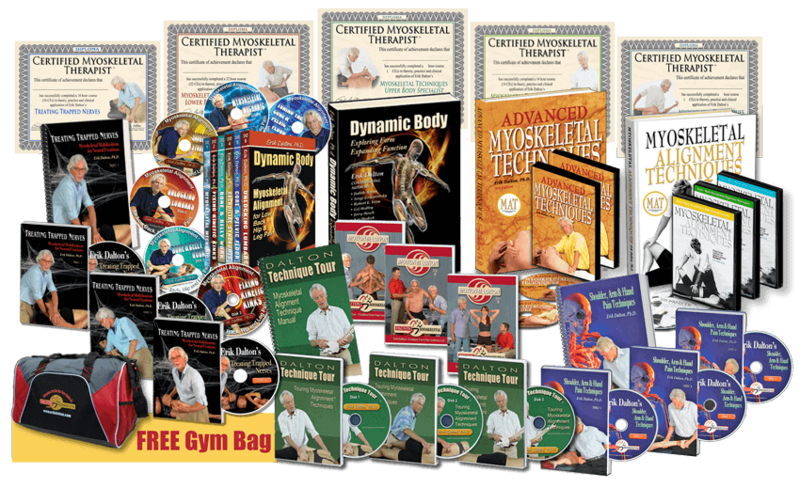 It is through these massage therapy CE courses that bodyworkers can earn the credentials of Certified Myoskeletal Therapist and Master Myoskeletal Therapist. If you have already taken a MAT class, you are most likely familiar with Dalton’s emphasis on skeletal alignment for pain relief. By blending muscle-balancing techniques with joint-mobilization maneuvers, MAT practitioners can help their clients resolve and prevent the kind of strain and pain patterns that limit physical function and decrease quality of life. Instead of temporarily easing a client’s pain symptoms, MAT actually looks for the source of the pain and seeks to address the cause of the problem rather than simply treating the symptoms. This integrative method of pain management combines the core principles of Rolfing, manipulative osteopathy and more.